We have been harvesting our potatoes over the last couple of weeks. One of the ways we use them is to make Mashed Potato Casseroles and freeze them for use this winter. So, how does this lead to Meatloaf and Gravy? While I was boiling the potatoes to mash them, I channeled my mother who wouldn’t through out the water used to cook potatoes or other vegetables. She would use it in sauces and gravies saying there was vitamins from the vegetables in it. I don’t know about vitamins but they do flavour the water. So, I decided to make a gravy out of the potato water. She Who Must Be Obeyed likes gravy on her meatloaf. 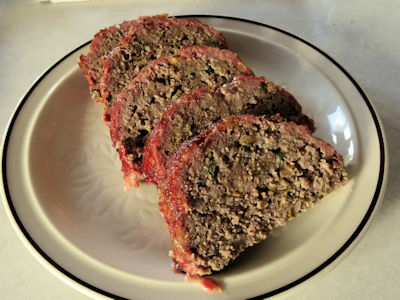 I have been wanting to try a meatloaf on my Louisiana Grills Smoker. Convoluted? Perhaps but this is how my brain works. I started by mixing the meatloaf ingredients together and forming them into a loaf shape. I put the loaf on a piece of tinfoil on a rack over a roasting pan. I preheated my pellet grill to 325 F. You can do this in an oven but will not have the nice smoke taste and red colour. I put the pan in the smoker and smoked for about 1 hour and 20 minutes to get the internal temperature of the meat loaf to 165 F.
I melted 50 ml (1/4 cup) of butter and sauteed 250 ml (1 cup) of coarsely chopped onion for about 8 minutes over medium heat. I added 1 clove chopped garlic and sauteed one minute longer. I stirred in 50 ml (1/4 cup) of flour and mixed to make a roux. 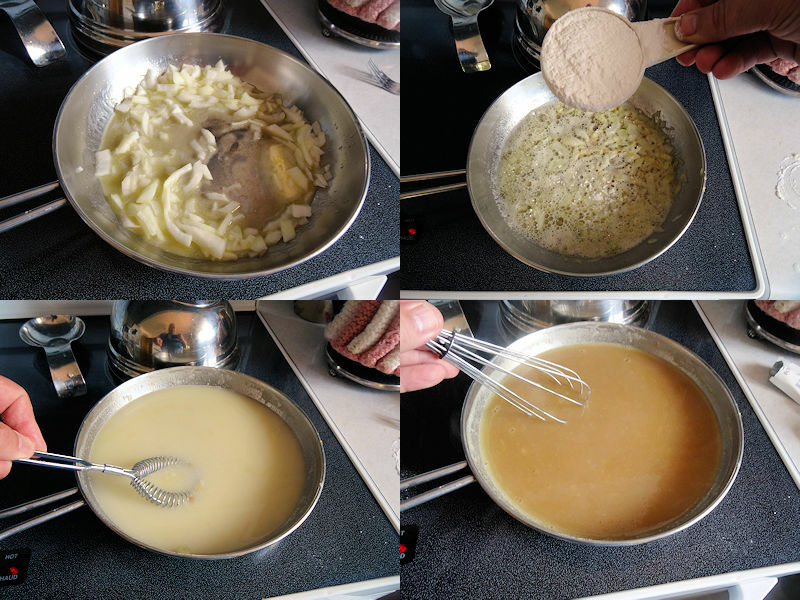 I whisked in 750 ml (3 cups) of the water from boiling the potatoes and whisk until it started to thicken. You can use plain water if you want. I added 15 ml (1 tablespoon) of beef base, 50 ml (1/4 cup) soy sauce, 10 ml (2 teaspoons) Worcestershire sauce, and 3 ml (1/2 teaspoon) pepper. I lowered the heat and simmered the gravy for a few minutes. The meatloaf was rested for 10 minutes and then sliced. 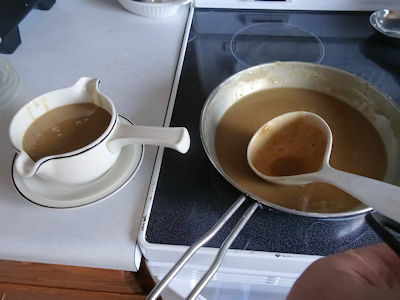 The gravy was put in a gravy boat. 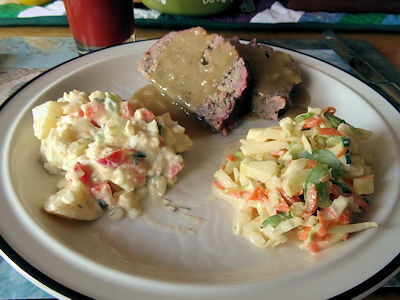 The meatloaf was served with potato salad and coleslaw. This was a great meatloaf. The pork gives it a great texture and the cheese helps keep it moist. 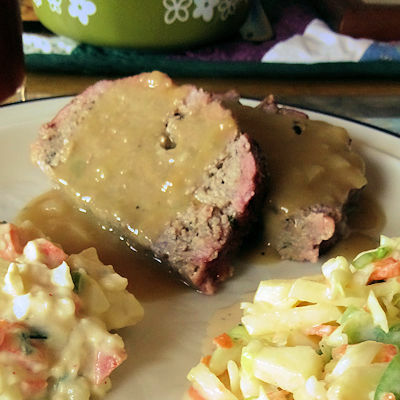 The gravy was tasty with nice onion taste that went great with the meat loaf. Love it! Form into a loaf shape and put on a piece of foil on a rack over a roasting tray. Cook at 325 F in a smoker or oven for about 1 hour 20 minutes to an internal temperature of 165 F.
Let the meatloaf rest for 10 minutes. Meanwhile, melt the butter and saute the onions for about 8 minutes over medium heat. Add garlic and saute one minute longer. Add the flour and stir until mixed with the butter. Whisk in the water and cook until thickened. Add beef base, soy sauce, Worcestershire sauce and pepper. Simmer for a few minutes.